With Mortal Kombat X's story spanning some 25 years after the events of Mortal Kombat 9, it's no wonder former Shaolin monk Kung Lao is looking a bit long in the tooth. It beats being dead. Not that he was dead at the end of the last game or anything. Well, not that being dead at the end of the last game matters. Hey kids, it's hat guy! 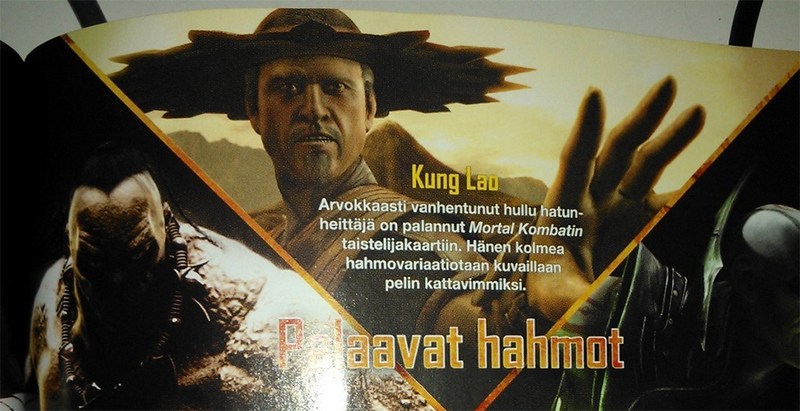 Kung Lao, like all of the characters in the upcoming game, will have three styles for players to choose from — the spinning Tempest, hat-tossing Buzz Saw and magical hat manipulating Hat Trick. The latter two sound the same to me, but then I never was much of a Kung Lao. Other information gleaned from the translation includes a faction-based social online multiplayer feature and the return of the challenge tower, now with challenges that change on a regular, sometimes hourly basis. You should really go read TestYourMight's translation. They worked really hard on it. So that brings the returning character roster to six — Sub-Zero, Scorpion, Quan Chi, Raiden, Kung Lao and Kano — seven if you count pre-order Goro, or nine if you count the bits of Sonya Blade and Johnny Cage that made it into their daughter, Cassie. Who else will make it in before all is said and done? I'm holding out for a wizened Jax with cybernetic replacement arms for legs.